We went ahead of Robert & Judith and had breakfast at the Crowbar CafÃ© in Shoshone. We all got together and drove the 72 miles to Furnace Creek in the center of Death Valley. The Valley is roughly 100 miles long about 13 miles wide and runs north & south between two mountain ranges. The mountains on the west side were snow covered with the peak 11,300 ft above the Badwater Basin. The Basin (see photo) is 282 feet below sea level. 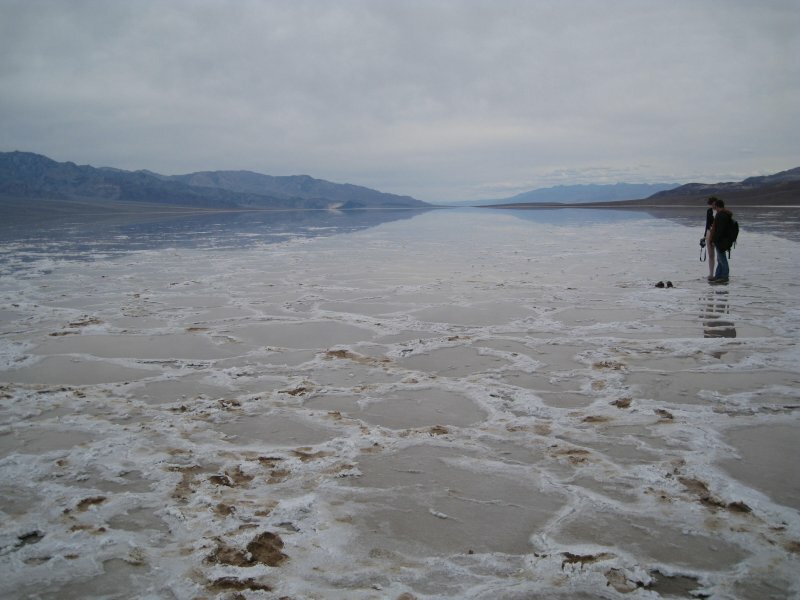 As the water in the lake evaporates it leaves the rectangular pattern of sodium chloride crystals. We walked a mile out into the lake to get that photo. There was a huge 100 and 200 mile race of bicyclists today. We must have passed 500. At one point they had to ride up hill for 10 miles on a 5% grade, then turn around and head down hill. After Badwater we took the one way Artists Drive up to a canyon called Artists Palette. As you might have guessed the rocks here are all different colors. Vehicles over 25 feet are not allowed on this road because they would get stuck in the dips. We set up camp at Furnace Creek in a large new campsite. There is no power or water at the sites.